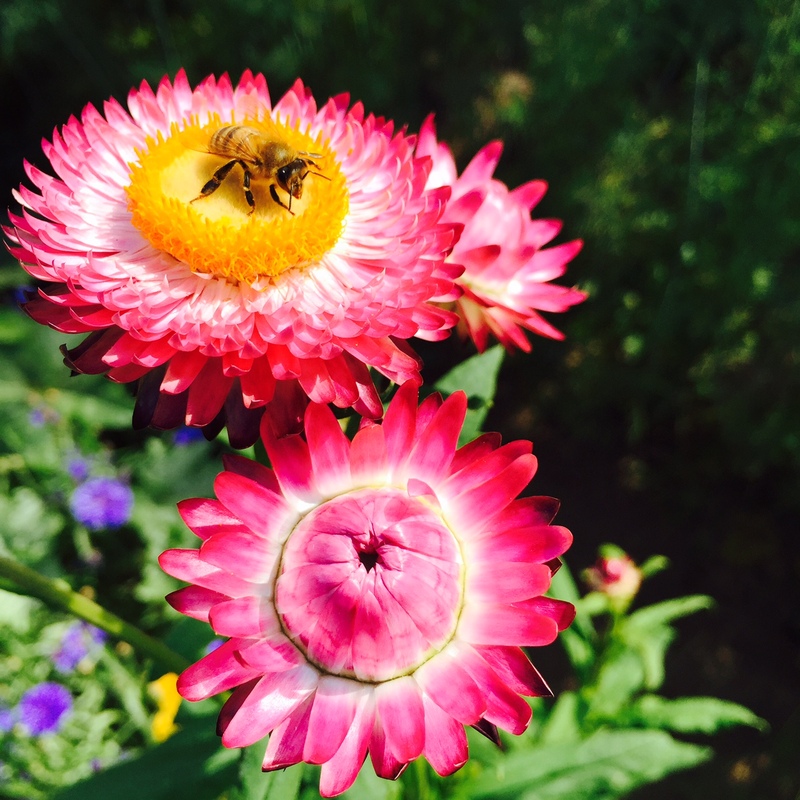 One of the strawflowers Patsy planted from the 25c seed packet from the dollar store. A bargain for something so lovely, in my opinion. 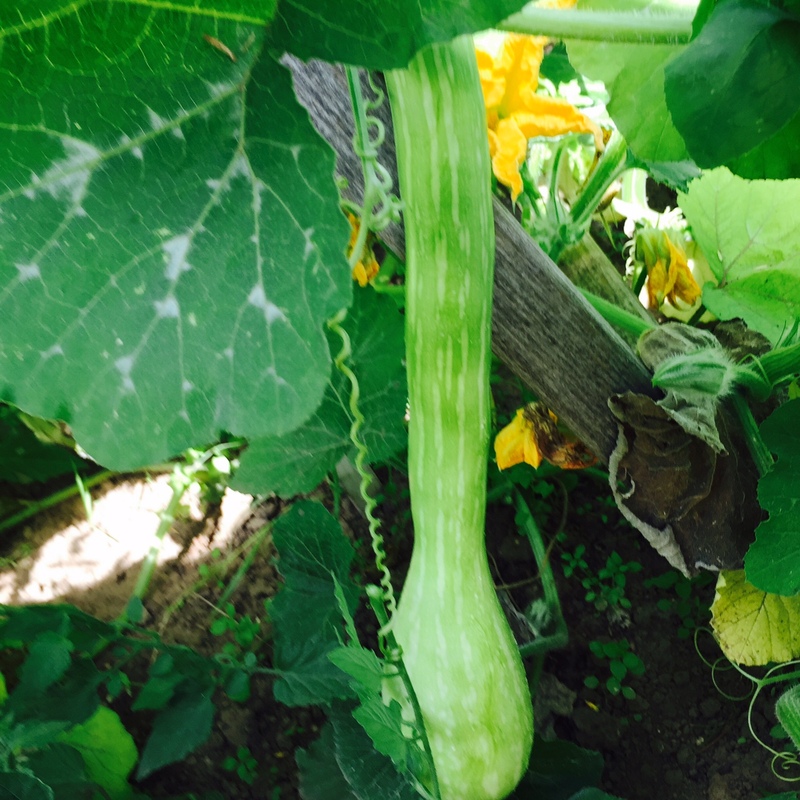 The one Tromboncini Zucchini plant that came up is producing. Not bad for old seed! The garden is just bursting with color and produce. Almost every day, I am privileged to spend a little time out there, either weeding or picking produce. 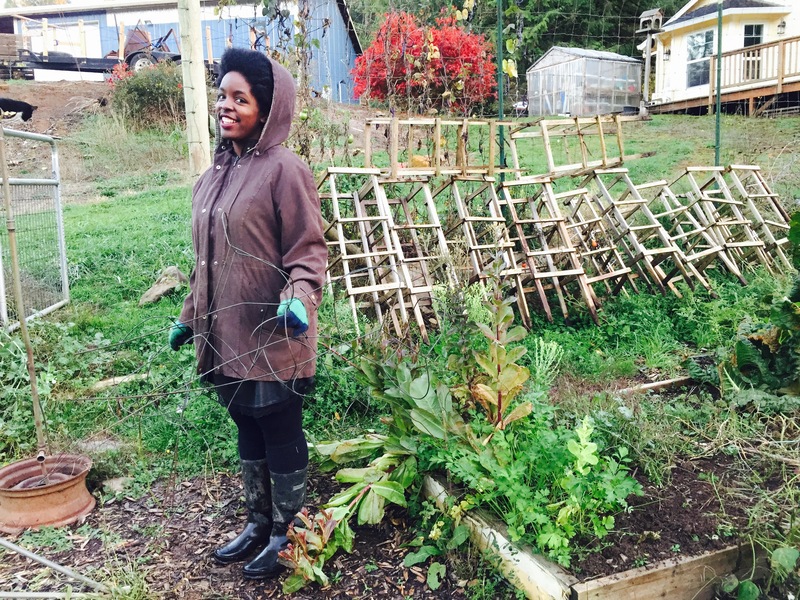 Ja’Ana has been weeding like crazy, as she desires to go to to quite a few youth events–Win-Win! Rob did some tilling, too. 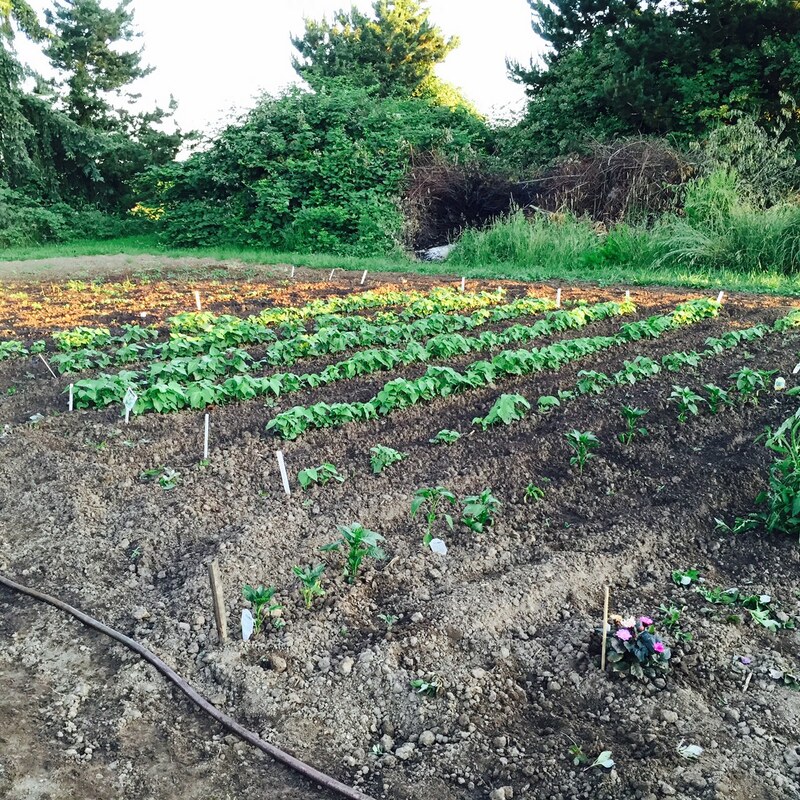 Already, you can see a large patch in the picture above where we have harvested all of the green beans that were there, and re-planted a few fall crops. I seeded in lettuce, spinach, cilantro, basil, boc choi, Swiss chard, snow peas, and Patsy planted a LOT of radishes. We don’t use many radishes, but she wanted to plant them badly, and we have the room, so…….Some of our seed is very old, and I am using things up, so we planted thickly and will thin if anything comes up. If they don’t….well I can live without radishes and I’m sure some will emerge. While cleaning out the seed box, I found several sunflower packets from years gone by. 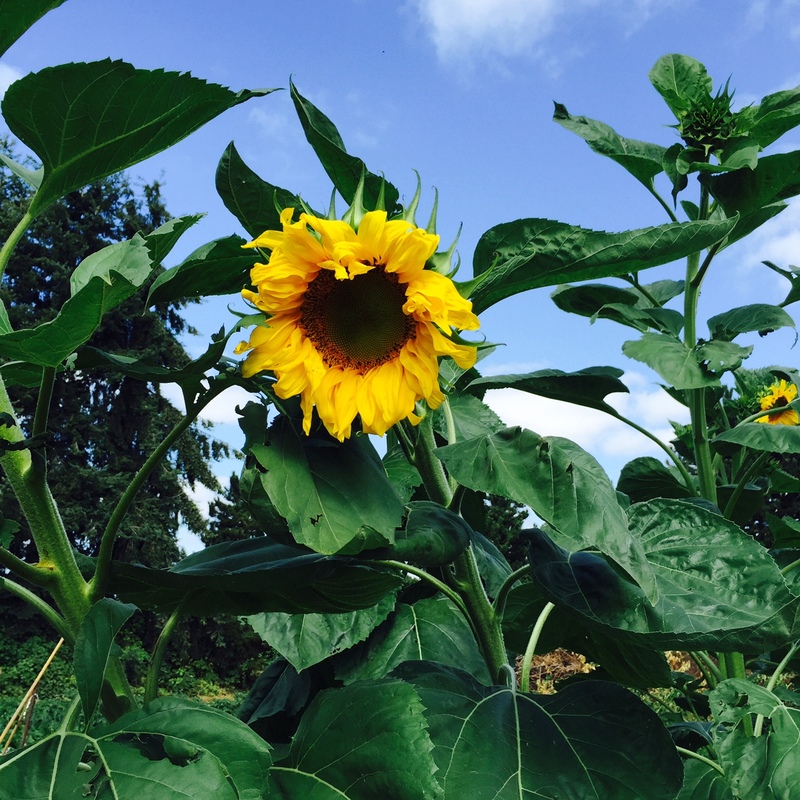 We planted them all, and these are the Mammoth Sunflowers. That seems to be what most of them turned out to be, and for sure, are the ones that are growing excellently. They’ve just started to bloom. 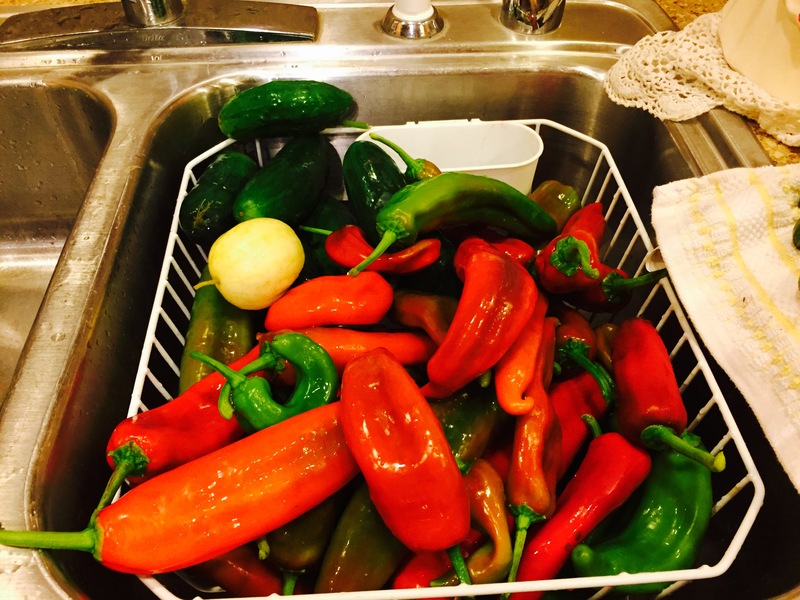 We’ve been getting peppers, cucumbers, beans, lettuce, tomatoes, potatoes, and more. As you can see, the corn is tasseling, but we have not gotten any of that yet. 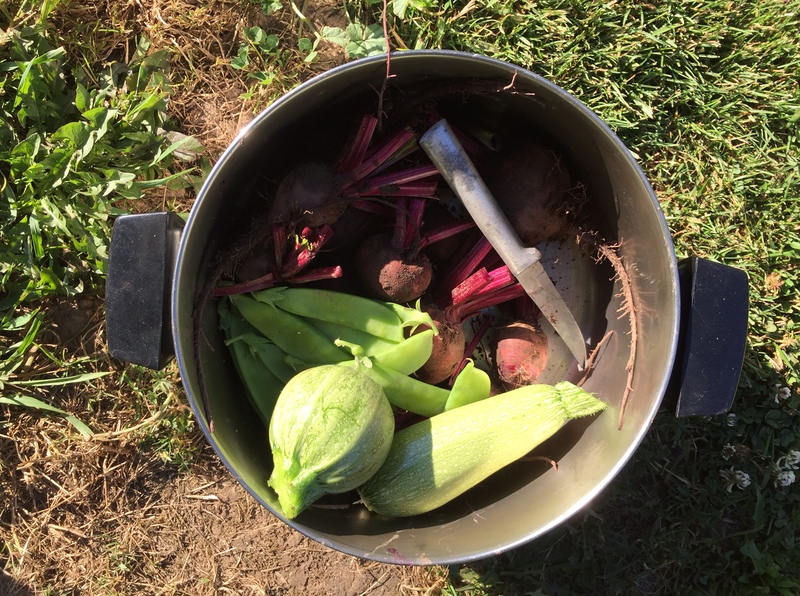 So, there is still much promise left in our garden and much good eating still to come! 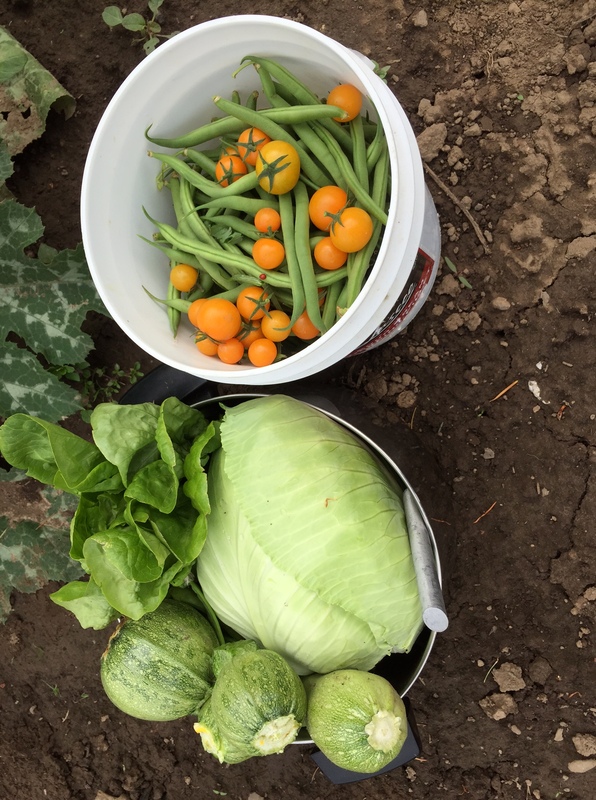 I came back from a few days at Champoeg State Park and found numerous goodies had ripened up in the garden! I’m especially excited about the green beans and the little yellow cherry tomatoes. Those are the first I have been able to pick, although my sister got started on them earlier in the week while I was gone. I made green beans and garlic tonight for dinner, along with coleslaw from part of the cabbage. I think I will make some fish tacos with some more of it, and make a grill basket with the round zucchini. There are also some onions you cannot see, as well as some snow peas. I will add some of them to the grill basket as well. Patsy’s flowers are blooming! They are lovely and will just get brighter and more beautiful as time passes. The squash on the left is delicata and has several forming. On the right in the back in a tronboncini squash, a kind of zucchini that grows to look like a musical instrument–I hope we get one. It isn’t even blooming yet. There is an acorn squash bush as well as mixed summer squash on the right. We were using up seeds, so have a little of several things. In the far center is regular, plain, green zucchini. I have been succession planting things. We are on our 3rd planting of lettuce, at least, with a couple more plantings coming up and growing nicely. I have a new planting of spinach up nicely, too. This week, I’d like to plant more lettuce, green onions and snow peas. Last summer I did not have to buy lettuce, except 1 or 2 times, and I’d like to repeat that. None of the rows are long. I just want fresh things to eat so they are not bitter from heat. It’s turning out to be a great garden and is easily feeding my family, my sister’s family, and quite a few other friends and relatives. It’s also working out very well to have more than one person working on the weeds and planting! Sharing a garden is really a blessing for both my sister and I. I’m glad. We got to cut our first 2 zucchini! This year, my sister and I planted many packages and partial packets of old seeds so we could use them up. These were from a summer squash mixture that was several years old. I have grown the round kind before, and they are prolific! So, I was glad to see that one of these turned out to be the round kind. 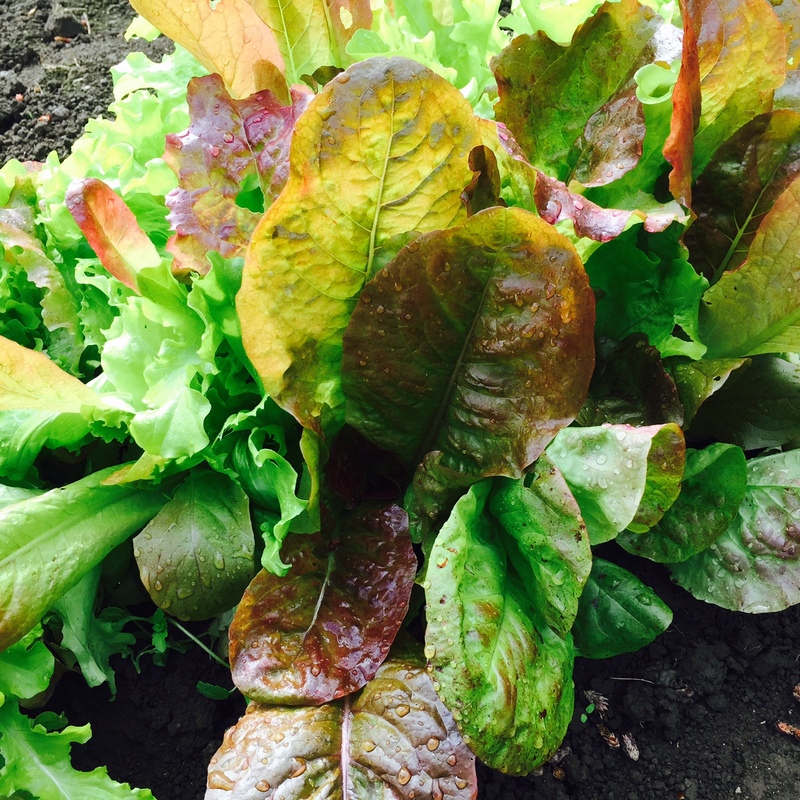 We have been picking and eating so much lettuce, we should be turning green any day! Snow peas, beets, basil, cilantro, green onions, spinach, and carrots are all ripe, too. Patsy’s sweet peas started to bloom. She had planted them at the old place and we moved these pots here with us. 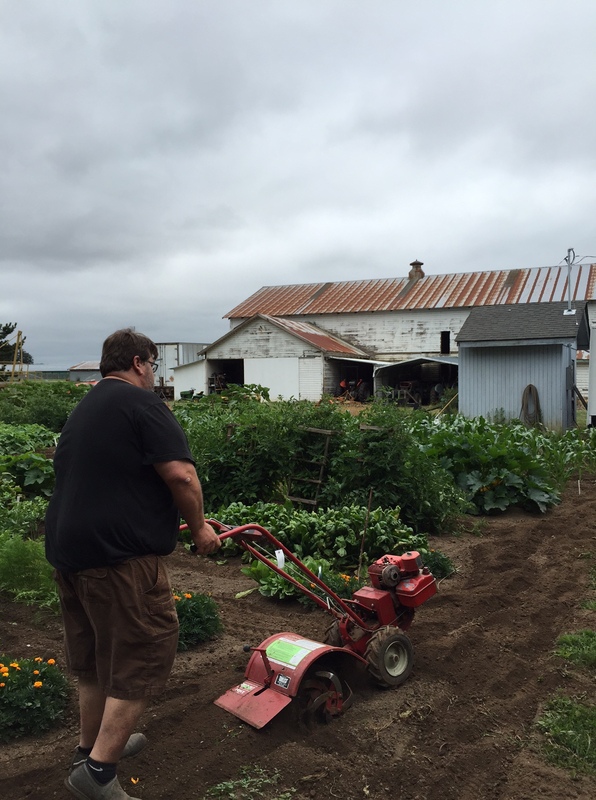 Of course, with all of the veggies growing, Rob needed to get out the tiller and get rid of the weeds. We’ve also been weeding between the plants, and hoeing where things have grown together too much for Rob to safely till between them. I spent some time thinning some lettuce. 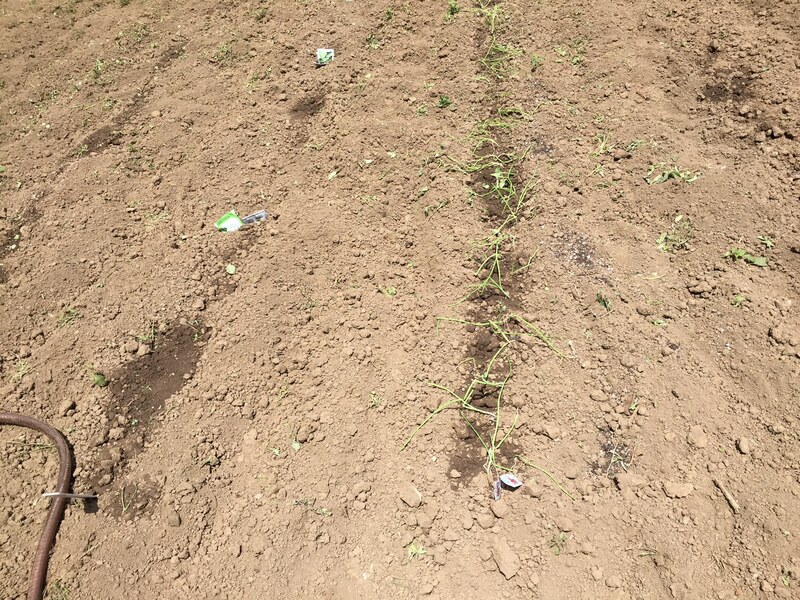 I’ve been succession planting it, and so have some that is about 1 inch tall, some newly planted that is not up yet, and the rows we are using currently. I’ve already taken out the first row we had. There is also new baby cilantro and basil coming up. I also spent a little time spacing out some baby head lettuce plants so that they can make heads. I’m so happy I have the garden to work in. It gives me something to do that I love. I always used to with I had more time to spend in the garden, so now I do, and I’m enjoying it immensely. 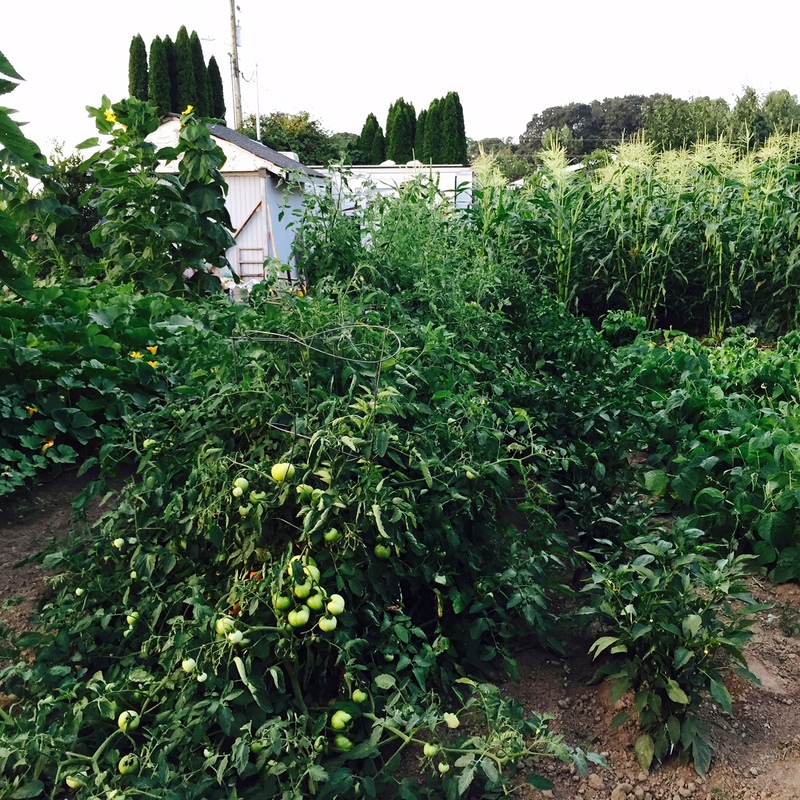 The garden has taken off with leaps and bounds with the unseasonably warm weather we had this past week. The cilantro is bolting, but the rest is just growing along nicely. 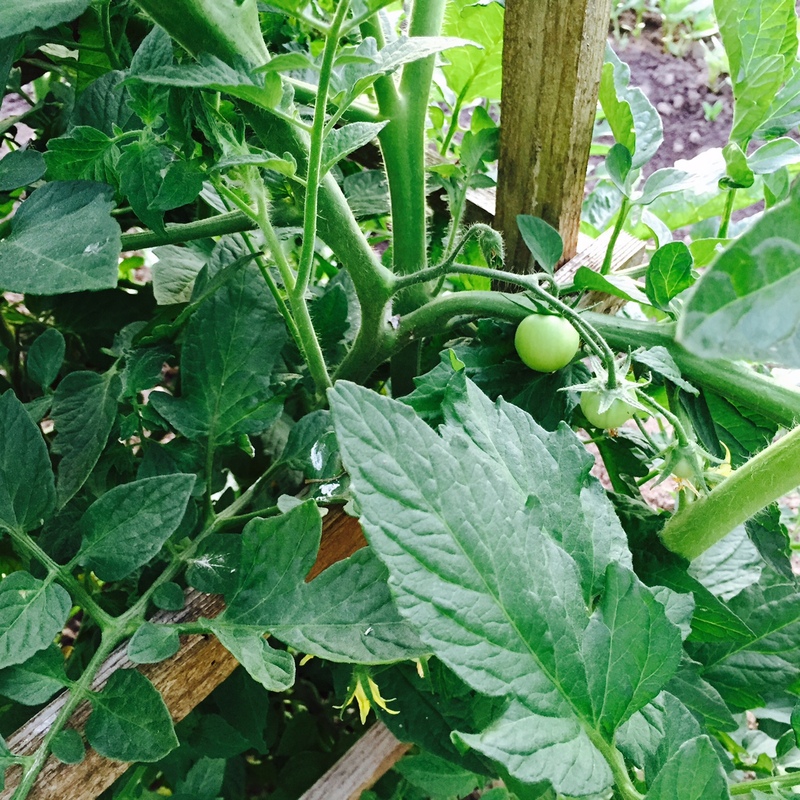 The 4 big tomatoes that we put walls of water around when we started them are huge and have set fruit. 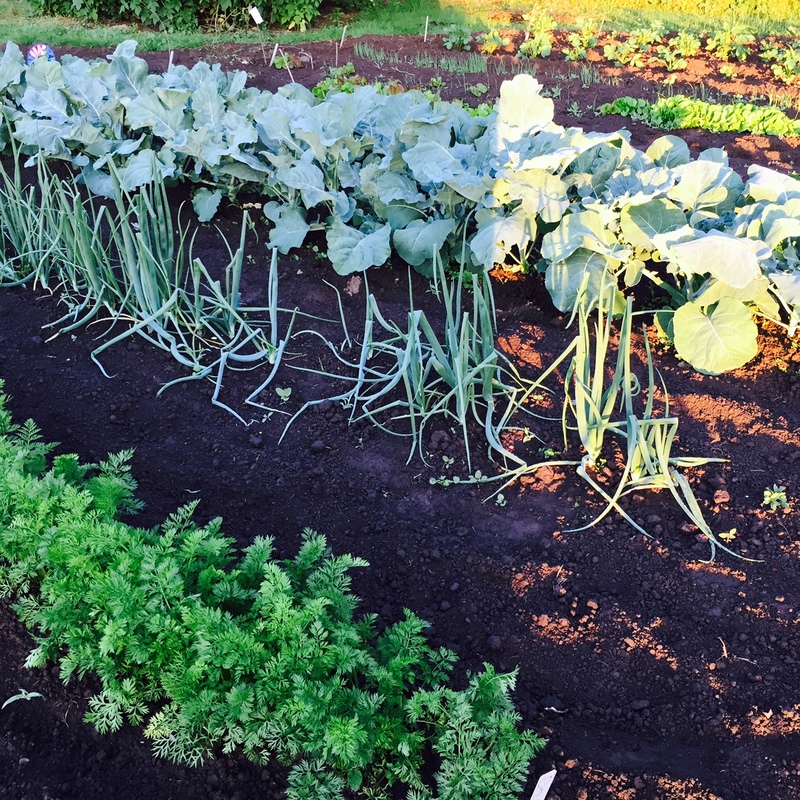 Carrots, onions, cabbage and broccoli are getting big, as are many other veggies. At this time, I am harvesting lettuce, spinach, cilantro and basil. I have snow peas forming and they will be the next item ready. The rest is going to take more time, but I’m very pleased with how much it has grown in the past week. This week is going to be cooler, so it will slow down, but the greens will like that better. I’ve been busy helping with cherry season, so haven’t worked in the garden very much. I did take the time to plant some more lettuce and cilantro. I plant short rows often, so that even when the heat comes, I hope to always have a new crop coming along that we can eat. Last summer, I only had about 2 weeks where there wasn’t good lettuce growing, but we will see if I can do as well this year. Rob is going to till it this morning, and everyone is going to pitch in and get some weeds out, and then it will be just fine for a few more days. 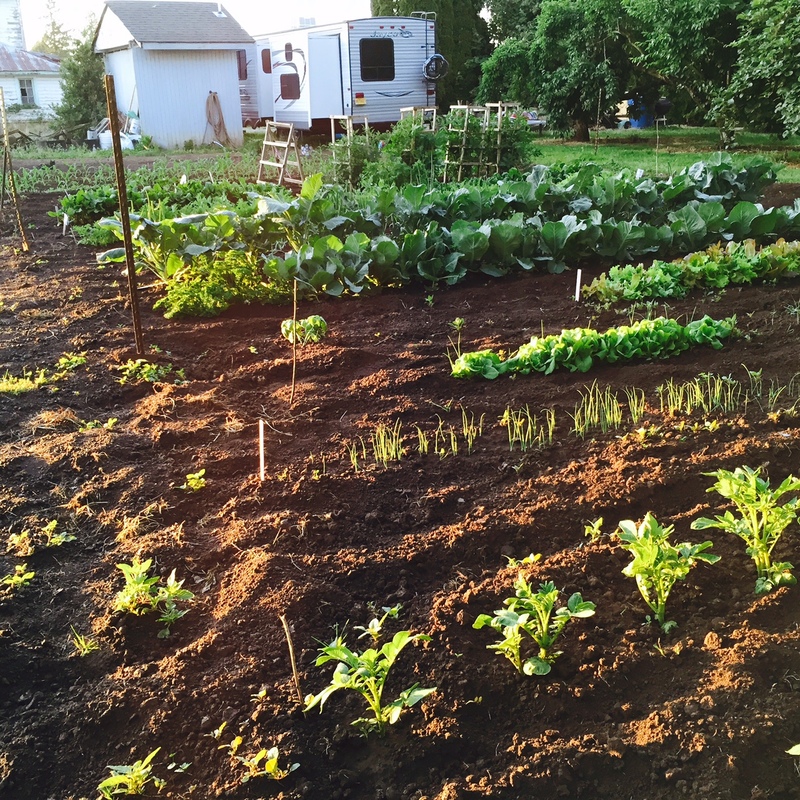 The garden is beginning to grow very well, and is giving us some delicious vegetables now. 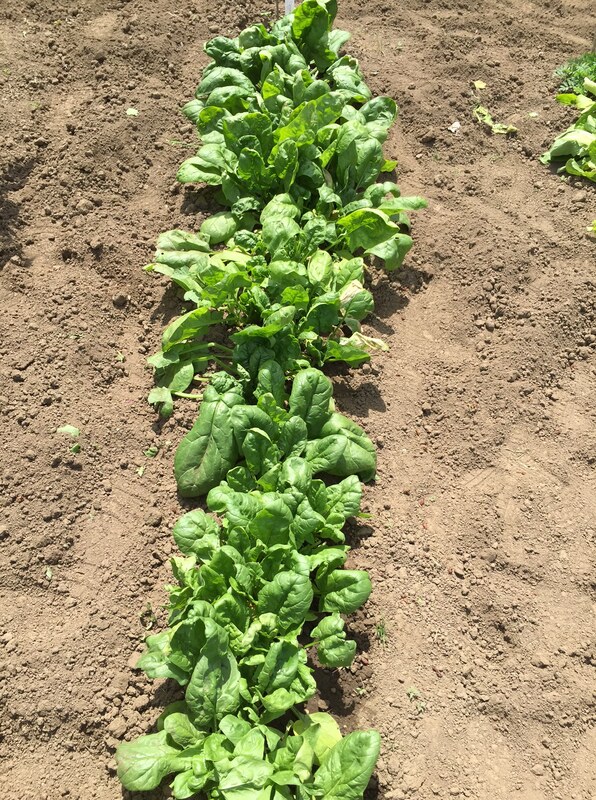 Before I left last Thursday for Ft. Stevens, I cut a lot of spinach, being careful to not take the entire plant. I left the small center leaves intact and only took the outer leaves. You can see from this picture that the part I cut has already grown a bunch more small leaves. There are still plenty of the large ones on the farthest plants, and I cut some more today. The weather has been very warm, so I expect the bushes will bolt soon, but we are enjoying it while it lasts. I also have been enjoying lots of lettuce. I cut and washed some more this morning. It just seems to grow and grow. I have several more batches planted for successive crops as soon as this first one gets bitter or bolts. Last night and this morning, I planted more lettuce (leaf and head both), another small patch of spinach, a pepper to replace a dead one, some basil, cilantro and dill seeds to replace some that did not come up, some more zucchini seeds to replace the bushes when they get the powdery mildew, a hill of lemon cucumbers and one of slicing cucumbers, and some red potatoes. I also did a couple of cartons of red onion plants. Both the onions and potatoes were on sale at Wilco, because they had passed their prime. I’m sure they will grow, though. 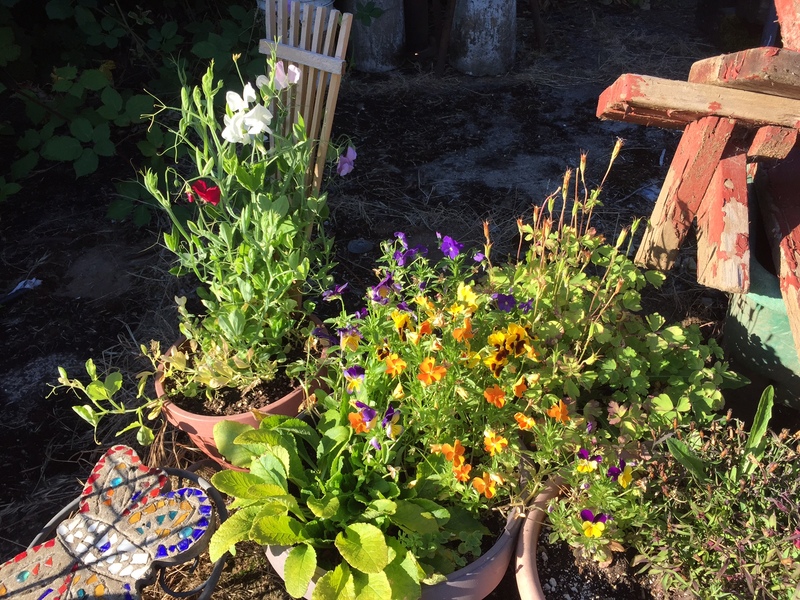 I watered everything in very well, as it has been quite hot for our part of Oregon. Rob tilled it all this morning, and I’ve done some weeding, as has my sister. So, we are good for a few days, other than watering. The garden is winding down. Yesterday afternoon and evening, Lovana helped me begin the clean-up job. She pulled out the tomato cages. I picked the last remaining vegetables off of dying bushes. There is much more to do, but we got a good start before it became so dark we could not see any more. 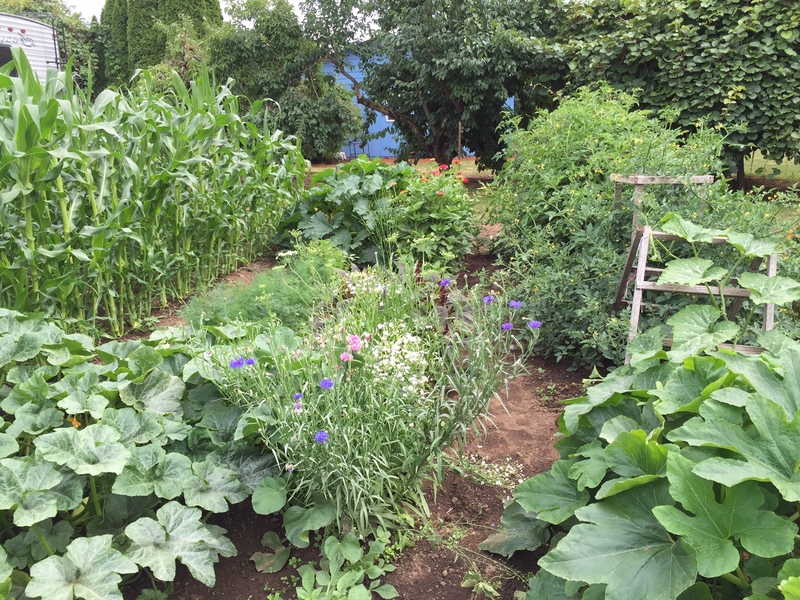 I have several large raised beds. 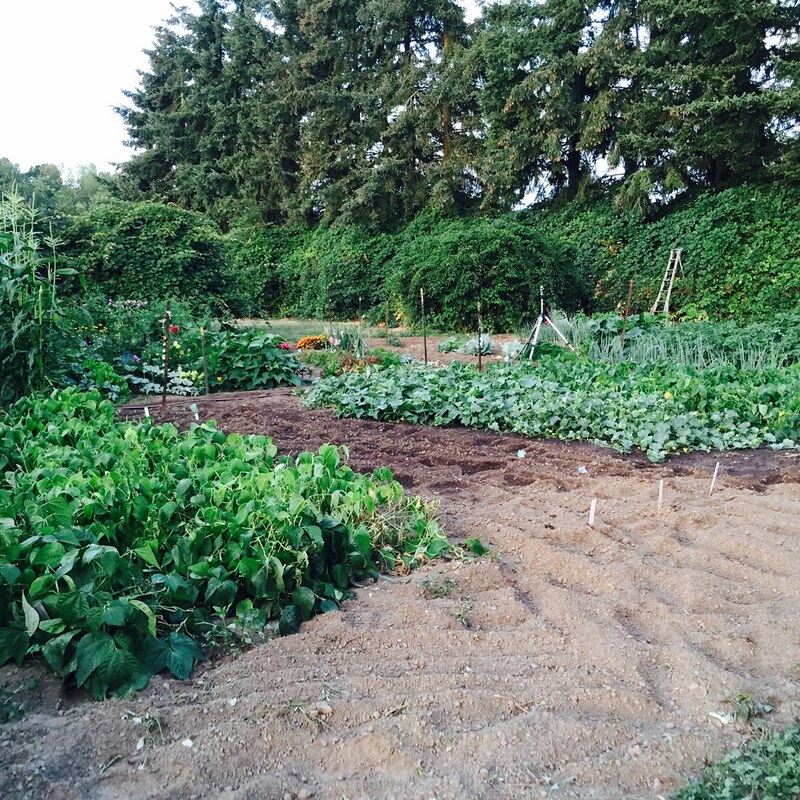 I have a large portion of the garden that is able to be tilled. About 1/3 of the fenced area is in berries, which are permanent. I was able to get a start on cleaning out the raised beds last evening. After I clean out the old plants, I will put compost on the emptied beds. 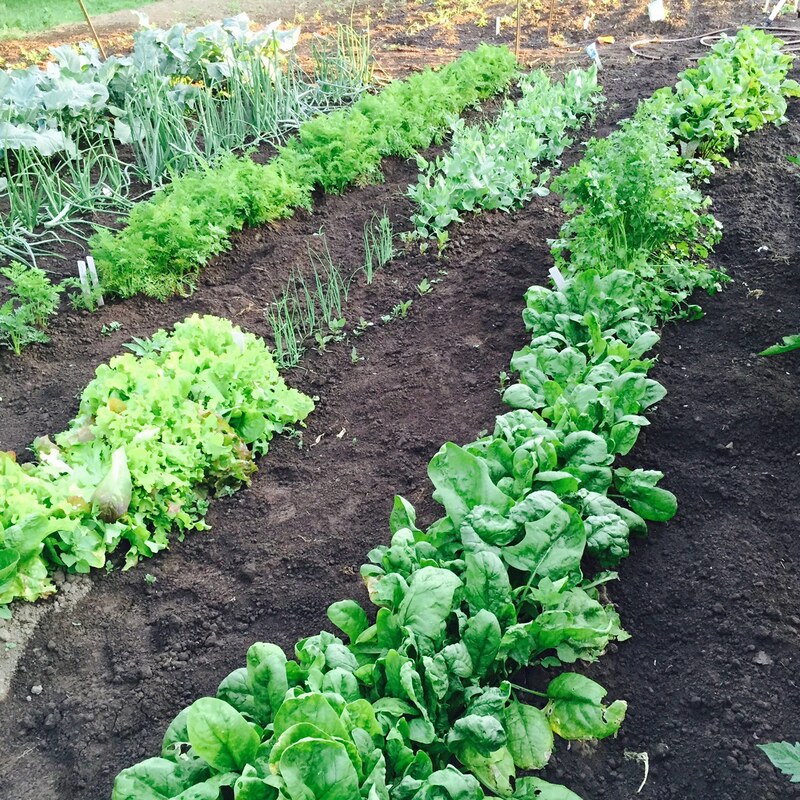 In one bed, I have some leeks, spinach, peas and chard, which I will leave in for the winter. There are also 2-3 plants of overwintering broccoli. I was able to get butternut squash, a few zucchini, peppers, and cucumbers. 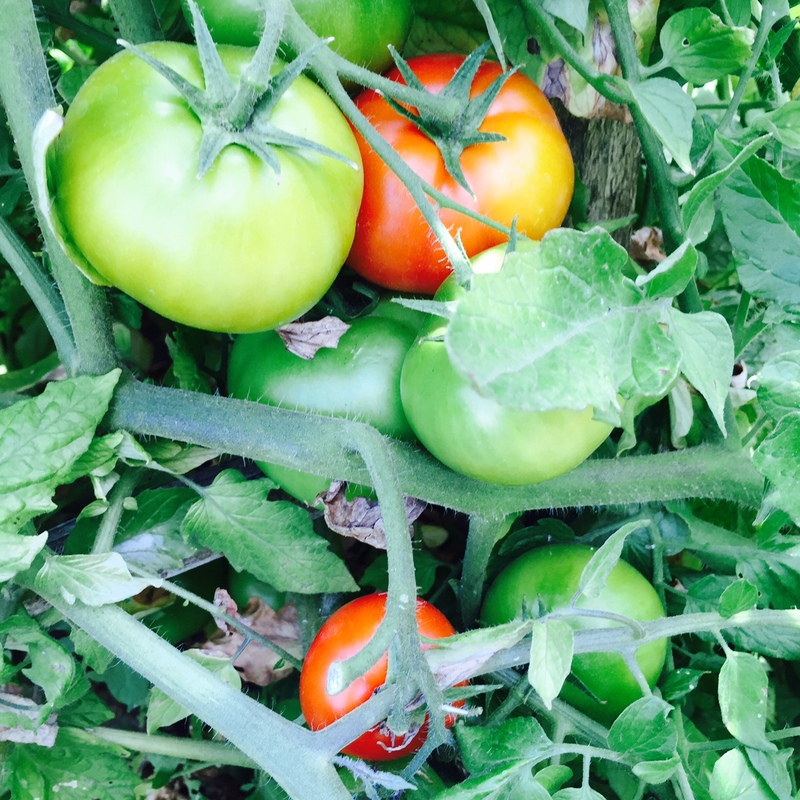 More tomatoes are ripening daily and there are many squashes that will be good for many months. 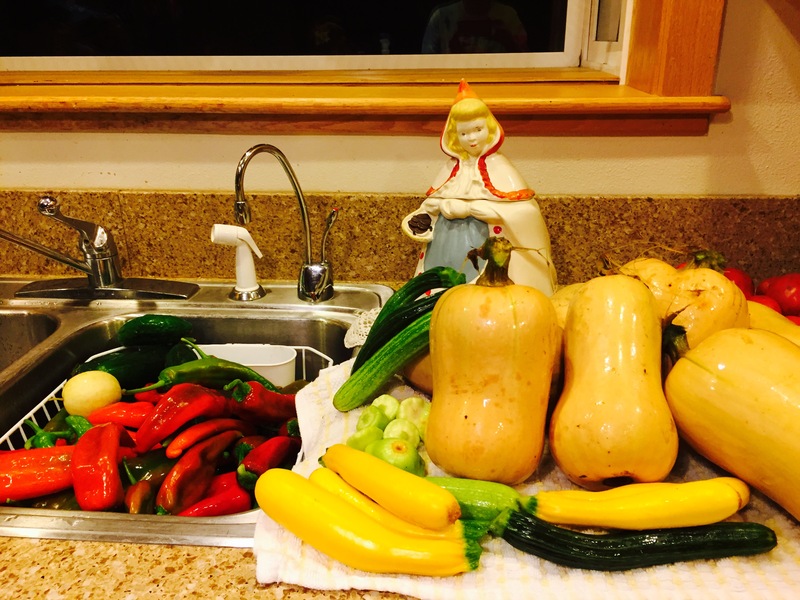 It was an extra-long growing season this year and I feel very blessed for all the wonderful produce we have harvested. This week was fun! My friend visited from out of town for 3 nights and we canned up quite a few things from the last remains of my bountiful garden. It is looking pretty bedraggled by now, but we found a few items that we could still use. She brought a few green tomatoes and a few peppers from her garden as well. The recipe we used was from the Foods of the Pacific Northwest pamphlet, Salsa Recipes for Canning. 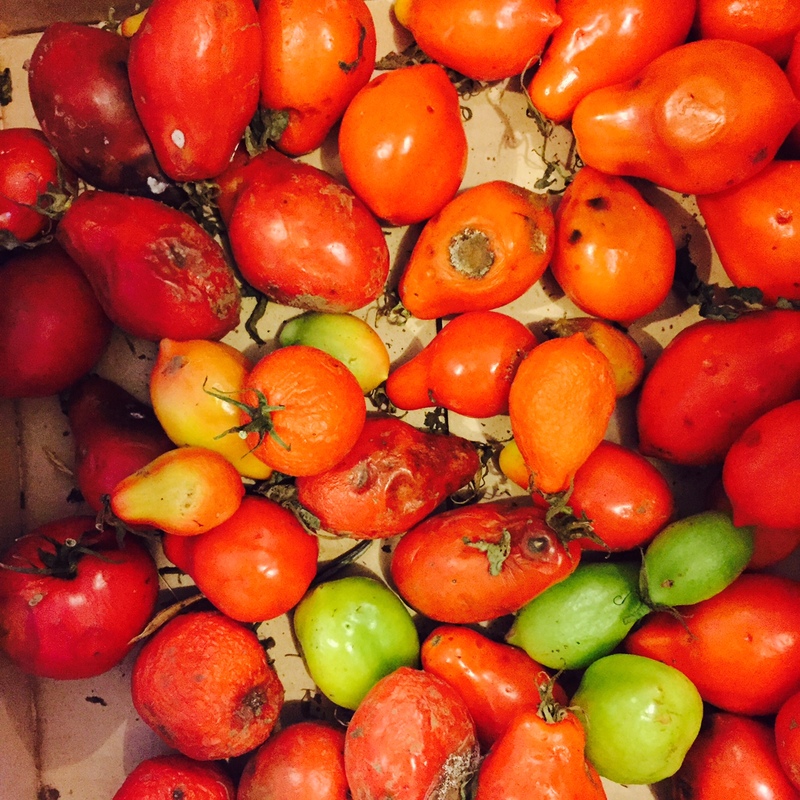 One thing we decided to make was Green Tomato Salsa, or Salsa Verde. 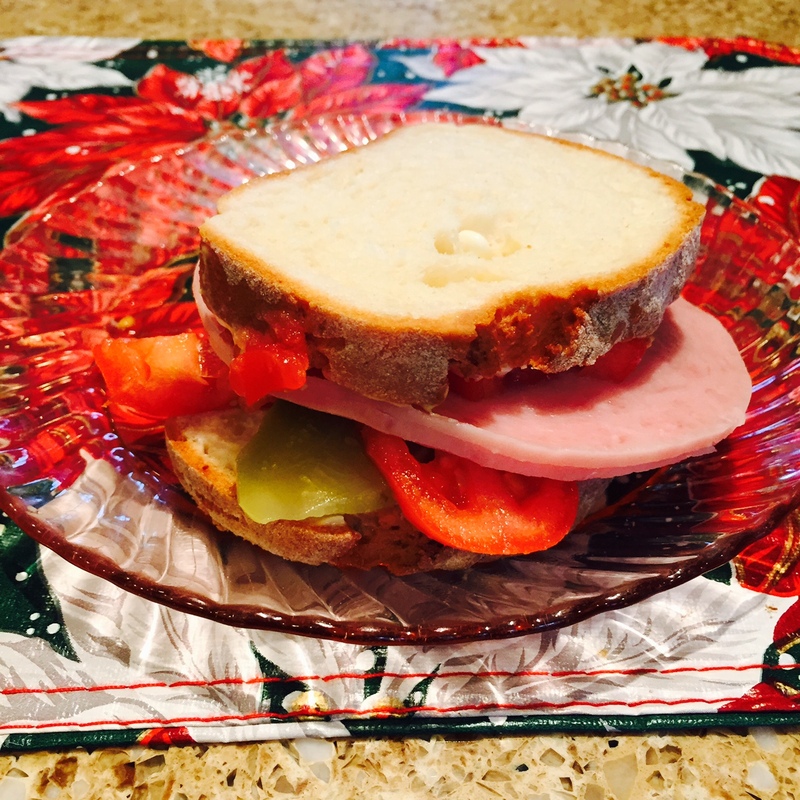 The recipe is also on the website for the National Center for Food Preservation. It is called Tomatillo Salsa, but I always use green tomatoes for it. We made a triple batch. The onions I grew this year were very small. We had to peel a LOT of them! We both cried a couple of times while peeling and as we got a whiff of the aroma when we started to whirl them around in the food processor. The rest was easy. We just chopped everything up, measured it out into a big pot, and followed the directions in the recipe. Then we canned it up. We got about 22-24 jars of various sizes, but most were pints. They all sealed and the next day, after they were cool, we put half in my basement and packed half for her to take home. We had a wonderful time, visiting and canning and agreed: We both have a strange sense of what fun is–but we both love to can and got a lot of pleasure from each other’s company and the rows of jars gleaming on the counter when we were done! 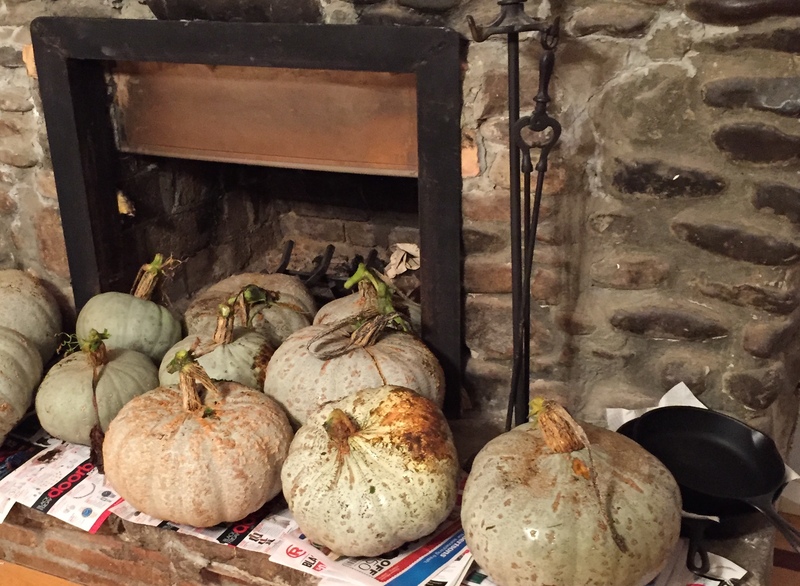 Sweetmeat squash curing on the fireplace hearth. We were blessed with a huge harvest of Sweetmeat squash. 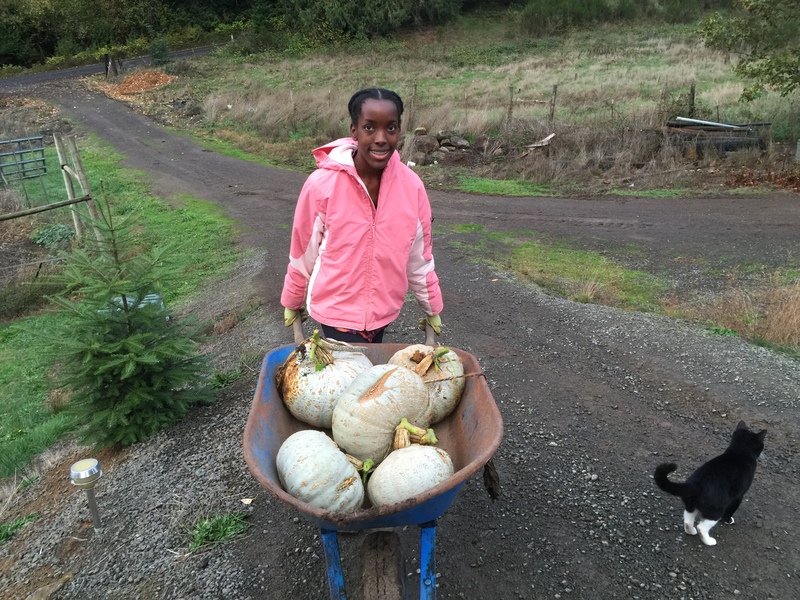 In the picture above, my 15-year-old, Ja’Ana, is bringing a wheelbarrow full up to the house for curing. There are many more down in the second garden by the barn. Some of these may be too small and immature to be good, but most are going to be delicious. We will sort them out by color, choosing to take the grayish ones over the greener ones. Also, the mature ones will be harder, and usually bigger. If we really can’t tell by looking, we simply open one up, cook a little bit in the microwave, and we know right away whether or not it has the delicious flavor we expect, or whether it is chicken food. You will notice in the picture that Ja’Ana cut them off with a knife, leaving a stem. This helps them stay good longer. We also put them in a dry place in the house for a couple of weeks to cure. This seems to lengthen their life as well. After they have been cured, we store them in the garage or shop in a cool location. Usually, we store them in a single layer. Sometimes we use newspaper to put them on, as seen in the picture above. At times, we have stacked squash in plastic crates in the garage. Last year, they were out in the shop on a pallet and the mice crept up through the boards and ate holes in them! We’ve even had chickens peck holes in them when we’ve left them out too long! So, we’ve learned to be more careful and you can be sure they aren’t going into the shop this year. Once we have the squash cured and stored well they keep for months. If one gets a soft spot, usually that can be cut out and the rest cooked and frozen, thereby saving most of the affected squash. To break one of these open, we use a hatchet and chop it. A large knife will work, but it is hard to safely cut it with a knife. Another method we have used is to drop the squash on a hard surface, such as a concrete sidewalk. It will break and can then be cleaned. The seeds are removed with a spoon, and the cut pieces are set onto a foil-lined cookie sheet and placed into a 350 degree oven. The squash is then roasted until soft, anywhere from 1 hour to 2, depending on the size of the pieces. It is done when a fork can easily pierce the flesh. Then the cooked squash is scooped out with a large spoon and ran through a food mill. I use a Foley Food Mill that I have had for years. Because the squash are so large, it is nearly impossible for our family to eat one up before it goes bad. We simply freeze the puree. We use squash in many ways. Sometimes it is served as a vegetable, and brown sugar is often sprinkled on top. We use this squash to make all of our pumpkin pies and other baked goods that call for pumpkin. It is less stringy than true pumpkin and has a very sweet flavor and a non-watery texture.